Tuning into RNA world, an international team of scientists has found a mechanism that might explain how bits and pieces of RNA could have joined together to form long RNA sequences, creating the stuff of life, or rather, the stuff of life to come, after a lot of evolution. The trick is, the bits and pieces of RNA would have had to assemble on their own, without the benefit of any living organism’s chemistry. Not a problem, say the scientists. Think of prelife chemistry as a dance of pixels, and at the level of pixels, consider the action of liquid crystals, supramolecular structures of the sort that today animate the display screens of flat-screen televisions, smart phones, and computer monitors. The liquid crystals of the RNA world, the scientists suggest, could have encouraged the formation of Earth’s first biomolecules. In an ACS Nano article (“Nonenzymatic Polymerization into Long Linear RNA Templated by Liquid Crystal Self-Assembly”) that appeared October 3, the scientists reported that when liquid crystals hold RNA molecules together, a chemical activator can efficiently join the ends of short RNAs to assemble long RNA strands. Specifically, the scientists studied the abiotic formation of interchain phosphodiester bonds in solutions of short RNA oligomers. The scientists considered various states of supramolecular arrangement and evaluated reaction kinetics. Scientists have speculated that life on Earth originated in an RNA world, where RNA fulfilled the dual role of carrying genetic information and conducting metabolism before the dawn of DNA or proteins. Indeed, researchers have discovered catalytic RNA strands, or ribozymes, in modern genomes. Known ribozymes are about 16–150 nucleotides in length. But it has not been clear how these sequences could have joined together in a primordial world without existing ribozymes or proteins. To explore the possibility that liquid crystals helped bring the RNA world into focus, the scientists, led by Tommaso Bellini, a professor of biomedical and translational medicine at the University of Milan, explored different self-assembly scenarios. They found that at high concentrations, short RNA sequences (either 6 or 12 nucleotides long) spontaneously ordered into liquid crystal phases. 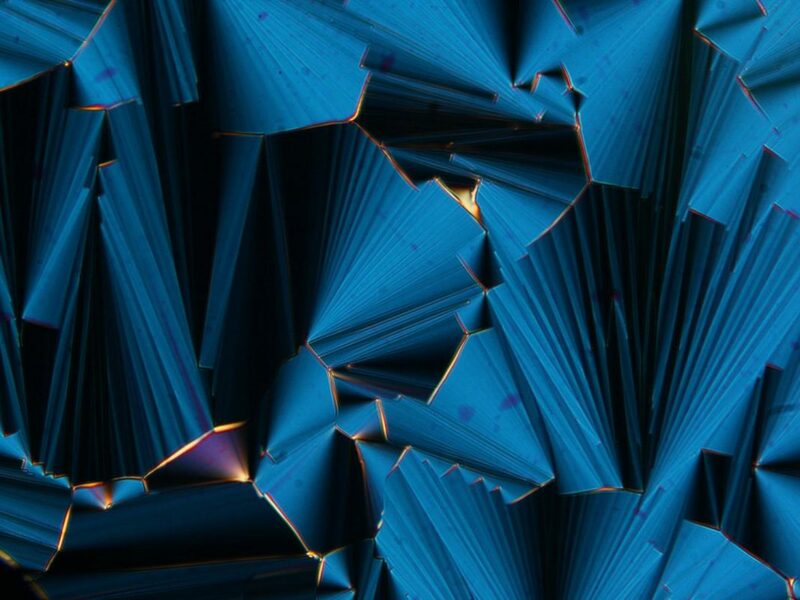 Liquid crystals formed even more readily when the researchers added magnesium ions, which stabilized the crystals, or polyethylene glycol, which sequestered RNA into highly concentrated microdomains. Once the RNAs were held together in liquid crystals, a chemical activator could efficiently join their ends into much longer strands. This arrangement also helped avoid the formation of circular RNAs that could not be lengthened further. The researchers pointed out that polyethylene glycol and the chemical activator would not be found under primordial conditions, but they say that other molecular species could have played similar, if less efficient, roles.